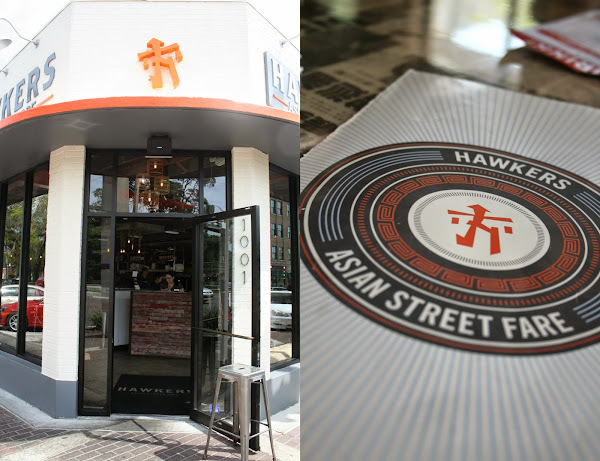 I have been dying to check out Hawkers on Park street ever since it opened a couple months ago. What was once a boutique store and an abandoned building is now transformed into a chic, modern, space. Hawker's offers small plates and appetizers along with more hearty entrees and even desserts. Hawkers specializes in mostly Thai/Vietnamese flavors and true to the cuisine, they bring out the food as it is ready, which means there is no use of heating lamps in the kitchen. I am digging these wok lights! Since we had a party of three our waitress suggested we order 5-6 small plates to share, needless to say we took her advice a little TOO literal and went tad overboard with 5 small plates, one entree, one side, and 2 desserts. Tip: If you are a member of Yelp, check in and you get a free order of edamame. First to come out was the Roti Canai (roughly translated to mean bread) which includes a traditional Malaysian flat bread paired with a spicy curry dipping sauce. Upon reading former reviews I heard that you MUST order this! While I enjoyed it, I did not think this was a necessary item to try. The flat bread was warm, soft, and chewy and the dipping sauce was flavorful with a kick at the end. It wasn't your typical appetizer but in my opinion there were more tempting options on the menu. Next to be served was some traditional spring rolls (you may add shrimp for an upcharge) made with with vermicelli, lettuce, basil, mini leaves, cilantro, carrots and bean sprouts wrapped in a chilled rice paper wrap and served along side a peanut dipping sauce. You cannot beat this classic, it was as well prepared as possible. The peanut sauce was to die for and I found myself putting it on the steamed rice (or anything for that matter). This was the only legit entree sized portion we ordered which was the Mee Goreng (meaning fried noodles). These Malaysian egg noodles were served in a tangy sweet chili sauce with tofu, shrimp, scallions, napa, bean sprouts, onions, carrots and potatoes. Garnished with crushed roasted peanuts. the entree portion would have sufficed for a light lunch, it was hearty and full of flavor. The tofu was well cooked and not a mushy mess like I have found before in dishes such as these. When we asked our waitress Alison about her favorite item on the menu, she undoubtedly answered the Fish Fillet with Black Bean Sauce. She stated that even as a girl who hated black bean she LOVED this dish. This entree included a seasoned fillet of cod battered and pan-fried then stir-fried with fresh bell peppers and onions in a black bean sauce (Alison recommended having it with a side of white rice). Having cooked with black bean sauce I have found this has the tendency to be overwhelmingly salty, however, they some how manage to balance these flavors in this delicious dish. The fish was lightly fried and kept it's crispy texture despite being covered in the delicious sauce. It was definitely one of my favorites. Lettuce Wraps stir-fried with shitake mushrooms, water chestnuts, carrots, bean curd, garlic and ginger with your choice of protein (in this case beef) and garnished with rice sticks. The mixture had a surprisingly sweet flavor with undertones of spice that paired exceedingly well with the cool, crisp lettuce wraps. You won't find any desserts on Hawker's menu but the server should be well informed about the options. Below we have the Vietnamese version of the creme brulee. Far from the classic French dessert, this has a flambeed durian custard topped with a purple mangosteen and durian puree. Let me tell you, I was hesitant to try this dessert, and for good reason. If you have ever been exposed to the...how should I say...unique flavor (and odor) of the durian fruit, there is no possible way you can fathom this fruit tasting remotely good. What I discovered was an exotic sweet flavor that left me wanting more, I finally understood why this fruit is considered a delicacy in Asian countries. This glorious looking temptation is Cinnamon Roti, a quesadilla-esq creation with cinnamon cream cheese layers served with a scoop of vanilla ice cream and fried dough crisps. This reminded me of a deconstructed apple pie a la mode, with all the familiar comforting flavors presented in a slightly different way. There are few restaurants I have been to that truly transform you through their cuisine, with Hawker's undoubtedly unique flavors and infinite options and pairings, they are a fantastic testament to one of my all time favorite cuisines. I was personally blown away by each and every dish and I cannot wait to make a return visit. That makes me want to go back...NOW! Hey, go to the end of their menu "By the Bottle". Interesting? !